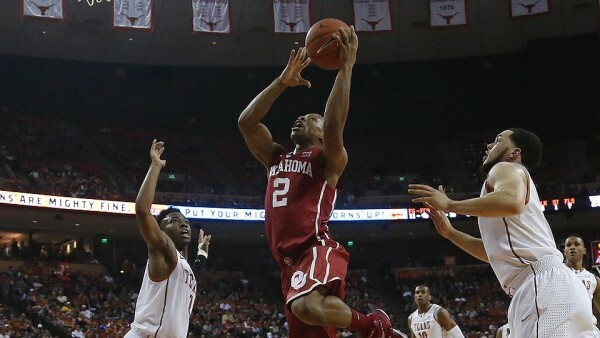 The fans were very quiet inside the Frank Erwin Center during and after Oklahoma finished ripping Texas apart, beating the Longhorns 70-49 with an excellent display of defense and smart, unselfish offense, suggesting they should be taken very seriously in the Big 12 this season. They handed Texas their third loss this season, which will knock Rick Barnes and his players from the top 10 while the Sooners, number 16 going into this game, are bound to get a serious bump, improving to 2-0 in conference play. Oklahoma attacked Texas where the Longhorns assumed they’d be the strongest and most dominant – in the paint, and did it without any of their players having an exceptional shooting night or performance. Texas entered the game allowing only 19.6 points in the paint on average, but Oklahoma scored 34 points, often punishing Texas for each and every one of their 12 turnovers, while TaShawn Thomas and Ryan Spangler blocked two shots each which led to more fast breaks. Texas have never allowed so many points in the paint this season, even not against Kentucky. Oklahoma had 51 touches inside the paint. Texas also struggled on the other end, shooting just 30.7% from inside the arc, its worst performance shooting the 2-pointer since a 29.4% shooting display against Kansas back in 2013. They’re shooting over 50% on 2-pointers so far this season. Their attempts from beyond the arc weren’t much better, making only 28.6% of their shots, while being unable to reach the line, going to shoot free throws only eight times during the game. The Sooners looked comfortable, too comfortable. They didn’t have to dive deep into their bench, with Buddy Hield being the only lineup player to spend less than 30 minutes on the floor (29). He led the team with 13 points and four more guys finished in double figures: Thomas and Isaiah Cousins with 12, Jordan Woodward and Dinjyil Walker with 10 points. Spangler had 9, but his defense in the paint along with Thomas might have been the most crucial piece in the Sooners running away from Texas in the first half to open a 33-14 lead. The Big 12, compared to other years, feels up for grabs. It’s deep as always, but Kansas, after almost a decade of dominance, might be on their way down, at least just a little. Texas seemed like the premier candidate to take over, but this loss and the performance from the Sooners, not just in this game as well, suggests there might be other contenders that need to be taken into account when it comes to displacing the almost eternal conference champion.